Yesterday, lovers all over the world celebrated Valentine’s Day, a day of love, of joy and happiness. Over the centuries, love has inspired writers, musicians, poets, painters, movie directors and even common people. It is said that it has great healing powers and the ones who love truly, live longer. Valentine’s Day origins lie in Ancient Rome’s Fertility Festival which was celebrated on the 15th of February. During the festival, the men had to pick a scrawl on which was written a woman’s name. Each couple had to stay united until the next festival. Usually, they fell in love and got married. This festival was celebrated only until 496, when it was replaced by Valentine’s Day. 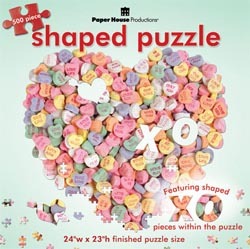 If you want to surprise your sweetheart with a love themed puzzle, Puzzle Warehouse is here to help by offering you a great variety of puzzles for lovers. For example, the 77 pieces Puzzleball Guardian Angel made by Ravensburger will put a big smile on her/his face. Who wouldn’t love a blonde chubby angel who is offering his big and loving heart? Then, you have the lovely Heart puzzleball. Perfectly crafted, curved puzzle pieces allow for an exact fit and are easily assembled together to form a solid, smooth ball - with no glue required! The final result is a unique, decorative piece that sends a sincere message to your soul mate. And for those of you who are single but secretly in love, the Fine Art 1000 pieces Jigsaw Puzzle by Ricordi Arte – Trionfo di Galatea might speak for itself. Those three cupids are all aiming in one point: the object of your affections. To see more of PW's puzzles for lovers, visit our online store and browse around. Tell us your favorites in the comments!